My initial reaction to The Road to Sparta is mixed. "There are always ups and downs during an ultramarathon," Dean Karnazes states. The same goes for this book. On the positive side I was happy to finally be able to read Dean's Spartathlon 2014 race report. The ten chapters (19-29) about the actual Spartathlon experience are the best part. It's all vintage Karnazes including battles with blisters, nausea, fans, journalists, traffic, air pollution, hallucinations, sleep running and out of body experiences. It was interesting to learn how even a seasoned pro ultrarunner can find it challenging to finish those 246km from Athens to Sparta within the 36-hour cutoff time. Amazingly there is a Vertical K skyrun (a mountain trailrun ascending 1000m by night) in the middle of this road ultramarathon. The trouble with the remaining twenty chapters is that they must pale by comparison. I found all the historic stuff borderline boring. I couldn't help feeling slightly sleepy while tracing the genealogy of Dean's calves and stuff like that. But I appreciate it was a 'voyage of self-discovery' for him. Also way too many pages were decorated by unnecessary adjectives, cliches, Greek words and quotations. Don't be afraid to skip a little here and there - you won't miss anything essential. References to marathon (both the victory and the modern running race named after it) could have easily been left out. First, the distance from Marathon to Athens is shorter than 42.2km. Second, Marathon was never featured in ancient Greek Olympics. Third, there is no proof that Pheidippides ever ran from Marathon to Athens. It may have been another messenger. In any case Persians invaded Greece a decade later, so the victorious Greek nike-moment was relatively short-lived. I found it a bit weird that to relive the Pheidippides experience, Mr. Karnazes chose to eat only authentic ancient Greek foods like figs during Spartathlon. I doubt it's so easy to make it feel the same. The roads didn't exist at the time, so it had to have been trailrunning all the way. Also the runners were barefoot or had simple gear like sandals at best, as they weren't sponsored by The North Face. 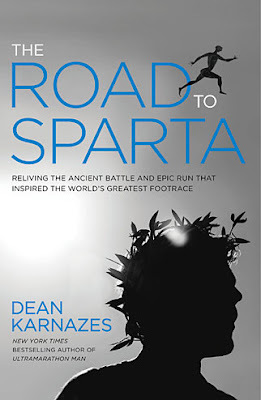 Another issue is that to really recreate the epic journey of Pheidippides in 490 BC, one would expect Mr. Karnazes to run the same way back just the way the original Ultramarathon Man did. After all, ultrarunners like Marvelous Mimi have successfully completed Double Spartathlon. Greeks invented democracy. Unfortunately our modern democracies are in ruins much like ancient architecture. We may have saved the banks, but possibly somehow lost the concept of 'rule by people' in the process. Dean observes: "Suddenly witness to the brutal realities pervasive in this world, I found it impossible not to recognize that in 2,500 years of conflict and warfare between men and nations, not much had changed... Like Greece itself, the Spartathlon had been a dichotomous experience." In summary, if Dean's first book Ultramarathon Man inspired you to run longer distances a decade ago, you'll probably enjoy reading this one as well. Surely in tough times we can be a bit like Dean in Spartathlon: "I won't give up without a fight." The Road to Sparta: Trailer from Barney Spender on Vimeo.